← “Hallelujah!” Updates… Gus Cannon Verified? Frankie Jaxon Nixed? Although I had been listening to their records for years, it was around 1969 when I finally saw The New Lost City Ramblers in concert at Portland, Oregon’s Reed College. Thinking back on the concert, I definitely remember their sharp and twisted sense of humor; present throughout the show… especially when introducing songs, but in their choice of music as well. 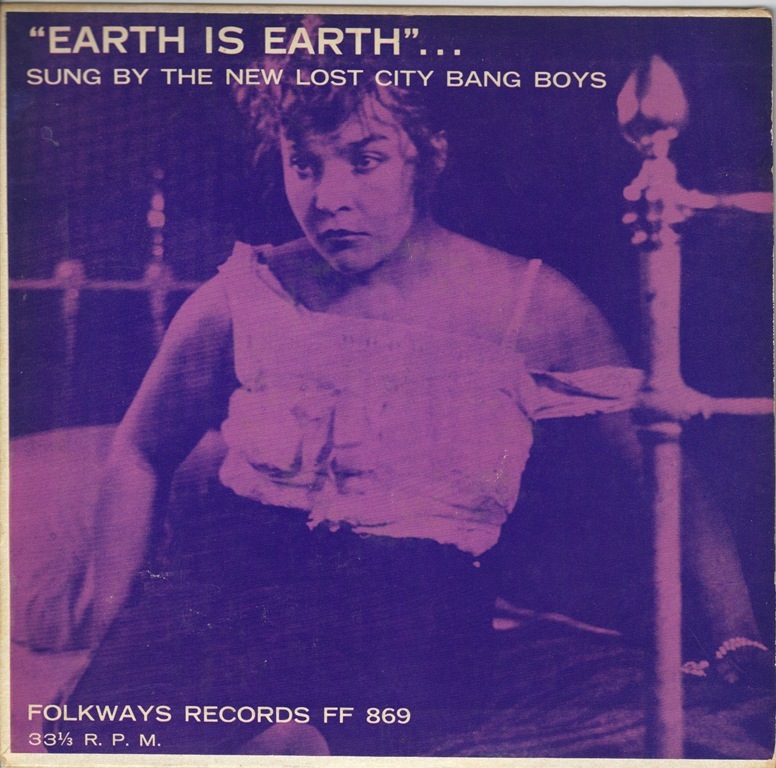 So, when I recently came across a NLCR record I was unaware of, the musical content came as no great surprise: The record is: Earth Is Earth by The New Lost City Bang Boys. 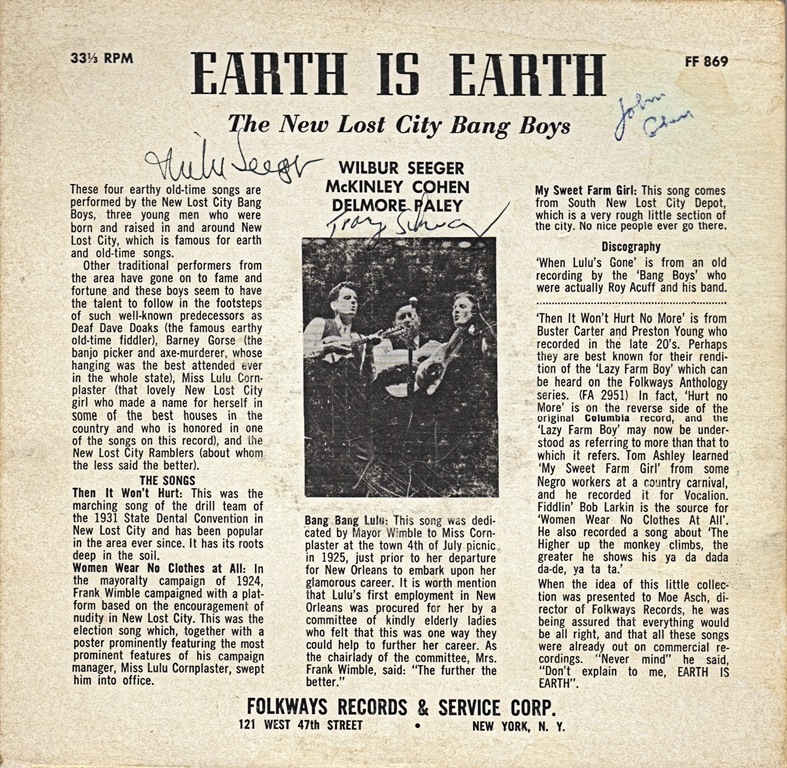 Earth Is Earth is a difficult-to-locate extended play (EP) disk of bawdy songs released by Folkways Records in 1961, and the name of the band, New Lost City Bang Boys is, of course, a very thinly veiled nom de disque for The New Lost City Ramblers. This 7 inch mini-LP consists of four nominally off-color (or “earthy”) songs which the NLCR learned from prewar 78 rpm records. While it’s possible the Ramblers might have considered the songs a bit too suggestive for some in their record buying audience of fifty (plus) years ago, it’s more likely that their nom de disque was more of a tongue-in-cheek effort to mimic the practice many performers used when they recorded off-color songs during the 78 rpm era. If my memory of their live show is accurate, the release of a record featuring ribald songs would not have come as a surprise to Ramblers fans… and supporting my memory, Bill Malone in his fine book, Music From The True Vine, Mike Seeger’s Life & Musical Journey, states that the Ramblers would often include risqué songs such as “Sal Got A Meatskin” and “Women Wear No Clothes At All” in their performance playlist. Although we usually associate 1920s – 1930s double entendre songs with “jass” bands, jug bands and blues music, bawdy songs were also well within the “old-time” canon. “My Sweet Farm Girl” is originally from Tom (Clarence) Ashley and Gwen Foster, recording as the Blue Ridge Mountain Entertainers. Recorded in 1931 and reminiscent of Alberta Hunter’s “My Handy Man,” it has few explicit moments among its double entendre lyrics. “My Sweet Farm Girl” was released on the 78 rpm Banner, Romeo, Oriole, Perfect, Conqueror and Vocalion labels. 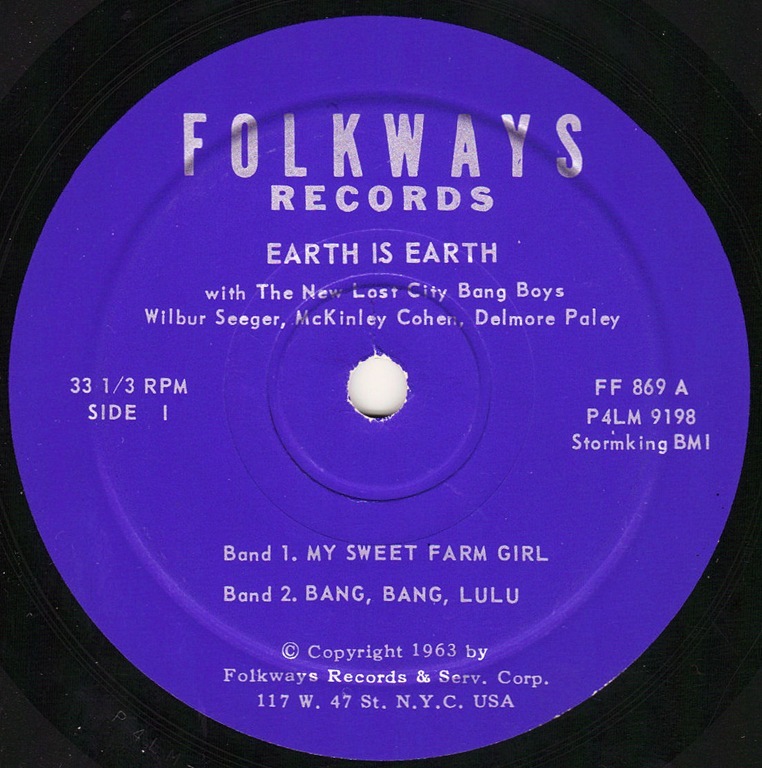 Of the four tunes on Earth Is Earth, “Bang Bang Lulu” has lyrics which may be the most overtly bawdy, but even by today’s politically correct standards the lyrics heard here are childish or sophomoric at best (or worst). An additional 20-odd “Lulu” verses appear in Vance Randolph’s Roll Me in Your Arms: Unprintable Ozark Folksongs and Folklore Vol.1. “It Won’t Hurt No More” is from Buster Carter, banjo/vocal & Preston Young, guitar. (with the Charlie Poole group’s Posey Rorer on fiddle). 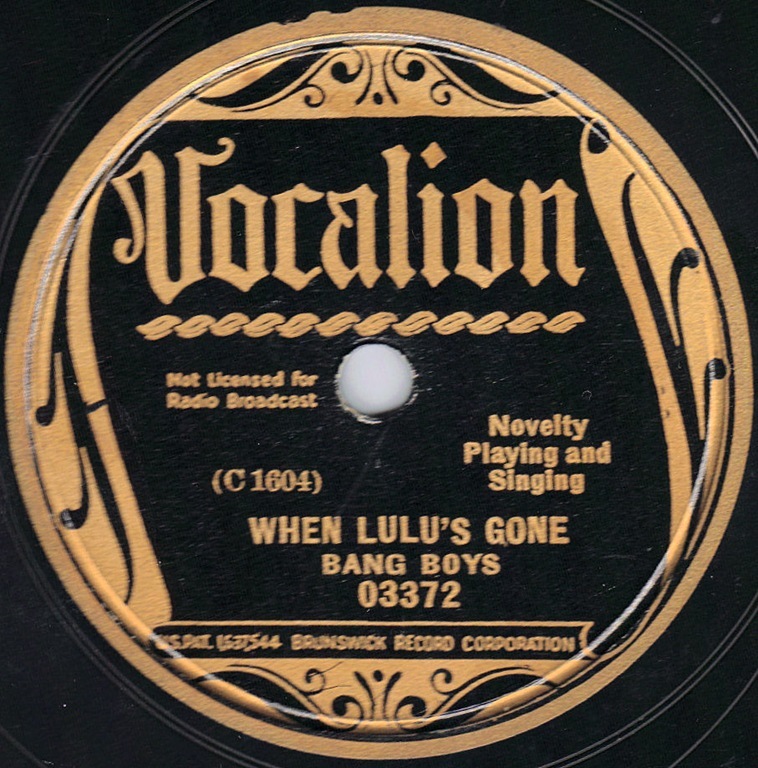 It was recorded in 1931 and is a hokum tune, similar to those heard from Tampa Red and Georgia Tom Dorsey. The 78 was released on Columbia 15702. “Women Wear No Clothes At All” is a catchy fiddle tune which describes a new standard for travel attire. The entire lyric is: “Women wear no clothes at all, but they get there just the same,” repeated multiple times… The Ramblers took the song from a 78 recorded in 1928 in Memphis by Fiddling Bob Larkin & His Music Makers. You can find the song on OKeh 45309. 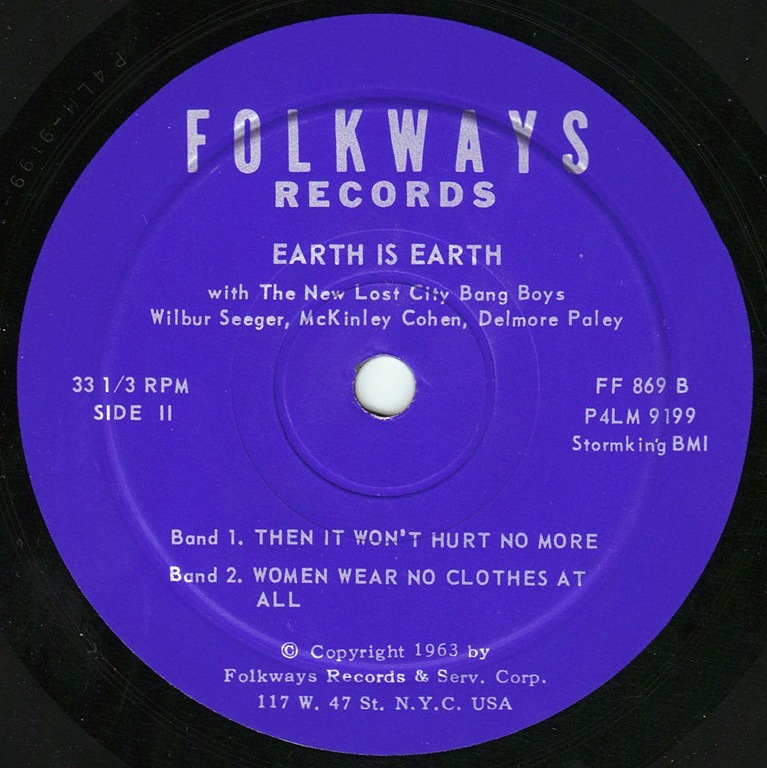 The exact number of Folkways Records FF 869 produced and/or sold is not known, but is thought to be somewhere in the lower end of the 500 – 1000 range… Roy Allen in his terrific book: Gone To The Country, The New Lost City Ramblers & The Folk Music Revival states that the album did not sell well, but does not list numbers. Current auction/sales indicate the value of Earth Is Earth is in the $75 – $200 range, depending on the condition of the record and jacket. I would like to close by mentioning two recently published books that I read this winter… both books are great and were timely, in that they helped inform the above subject. 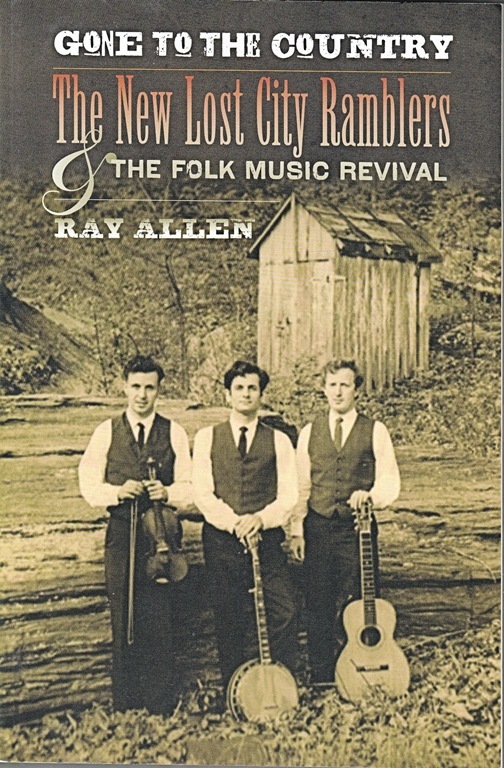 The first, written by Ray Allen and published in 2010 is titled: Gone To The Country, The New Lost City Ramblers & The Folk Music Revival. 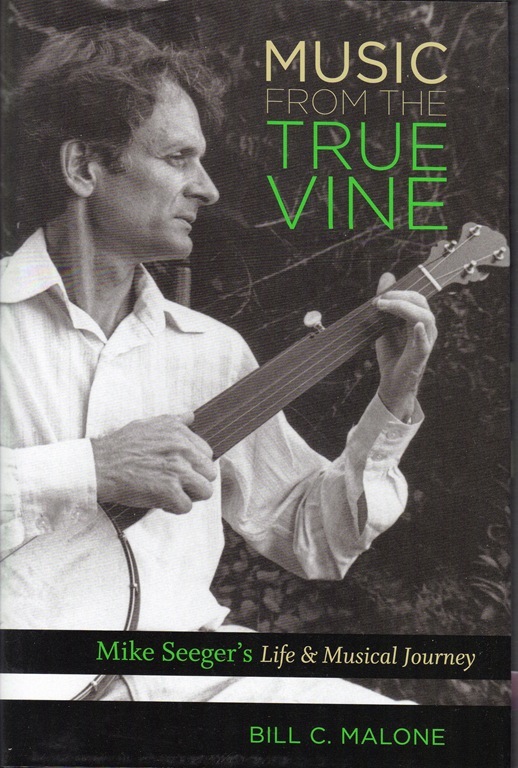 The second is written by Bill C. Malone, published in 2011 and titled: Music From The True Vine, Mike Seeger’s Life & Musical Journey. Both books are well worth a read, and much to my surprise there was a good deal less content overlap than I had initially supposed. While each of these fine books warrants a full blog entry/review, I will instead offer a thumbnail impression… The titles say it all. If your primary interest is the NLCR then the Allen book is the one for you. It is an exhaustive look at each of the Ramblers, their individual strengths and the dynamics within the group, as well as the New Lost City Ramblers relationship to the folk music revival. Malone’s book keeps its focus on Mike Seeger and does an excellent job of detailing his coming of age within his musical biological family and his position within the Ramblers. Also, it nicely illuminates his solo work as well as his group work outside of the New Lost City Ramblers. It’s without reservation that I recommend an immediate trip to your favorite bookstore or library to secure copies of these books! 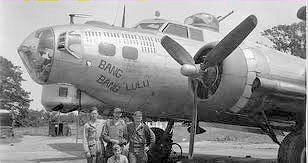 From the official website of the World War Two 447th Bomb Group Association, here’s a B-17 bomber built by the Boeing company in October 1944, and assigned to the 708th squad. Lulu goes to Jamaica… Bang, Bang, Lulu, reggae! Bang Bang Lulu would be a great name for a jug band.